Elvis fans! We know you're out there! We have a special set of Las Vegas Elvis wedding packages, just for you. 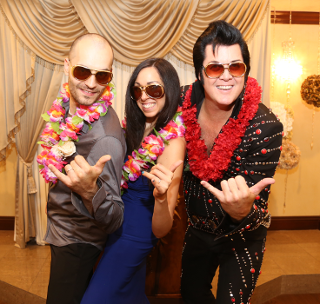 Our Elvis wedding packages offer all of the traditional Las Vegas wedding services, Professional Photography, Video Services, Floral Arrangements, Web Broadcast Services, all with The King in attendance. Upon request, Elvis will walk the Bride down the aisle, give her away, and provides musical entertainment for the couple and guests to enjoy. It's safe to say, the atmosphere of our Elvis Weddings are transformed to a more festive celebration. If permitted, Elvis will conclude the ceremony with "Viva Las Vegas", as he invites the newlyweds and guests to get up and dance, with some of our wedding parties dancing all the way out the doors. At the conclusion of Elvis' performance, an Elvis wedding would not be complete without hearing..."Elvis has left the building..."
If you have any additional questions about our Las Vegas Elvis wedding packages or our reservation process, please don't hesitate to contact the chapel. We are open from 9:00 AM to 11:00 PM, seven days a week.